The Navy SEALs Fund – Brotherhood Beyond Battlefield® is proud to offer our very first raffle, in honor of an American Hero. All money raised from the sales of the raffle tickets will go to the Legal Defense Fund in support of Chief Eddie Gallagher and his family’s needs during this time of great stress. Purchase a Raffle Ticket at $10.00 per ticket. One ticket equals one entry into the Raffle. There is no limit to the number of tickets (entries) you may purchase. The Navy SEALs Fund – Brotherhood Beyond Battlefield® - is urgently raising funds to assist with the costs of US Navy SEAL, SOC Eddie Gallagher's legal defense. He has been accused of doing his job and taking the fight to the enemy, and now faces charges of mistreating an ISIS fighter. On Patriots Day, September 11th, 2018, Chief Eddie Gallagher was shackled like a common criminal, taken from in-patient care at NICoE Pendleton, and held in solitary confinement for 72 hours while remaining shackled. He has now been in jail for over a month on pre-trial confinement. As he and his legal team prepare an upcoming defense before the United States Navy to fight these absurd charges, he and his family need your support. Chief Eddie Gallagher is a tried and true Warrior. He has earned multiple decorations including three medals for valor in combat. He has sacrificed greatly for the country he loves, ensuring you and your family can sleep peacefully in the warmth of your beds at home. Please understand this fight is not just about Eddie, there is a war taking place at home for our Warriors. We are on standby to assist other Navy SEALs also fighting to restore honor and integrity to their names, backed up by the reputation they have built through decades of selfless sacrifice and taking the fight to the enemy. These are Highly Decorated, Honorable Warriors, who are facing outrageous allegations and fighting for justice while maneuvering within the UCMJ system. Let us make a statement with Eddie's case that the Brotherhood and American's everywhere will not stand for injustice forced upon our Heroes through the manipulation of the UCMJ system. 100% of the donations raised by this campaign will be used for the Legal Defense of Eddie and support for his family. 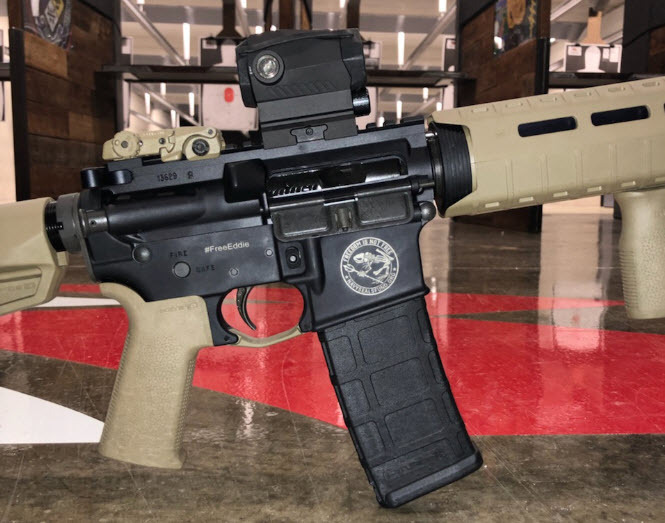 *Custom Firearm imprint with #FreeEddie and "Freedom Is Not Free" Bone Frog logo from Navy SEALs Fund are being donated by Fire Lance Arms & Outfitters. PLEASE REVIEW THESE OFFICIAL RULES CAREFULLY. DO NOT PARTICIPATE IN THIS RAFFLE IF YOU DO NOT MEET THE ELIGIBILITY REQUIREMENTS SET FORTH IN THESE OFFICIAL RULES. BY PURCHASING A RAFFLE TICKET FOR THIS RAFFLE, YOU CERTIFY AND ATTEST THAT YOU HAVE READ, UNDERSTOOD AND AGREE TO THE TERMS OF THE OFFICIAL RULES RECITED HEREINAFTER (AS DETAILED IN THE OFFICIAL RAFFLE RULES LINK), AND THEREBY PROMISE TO ABIDE BY AND BE BOUND THEREBY. VOID WHERE PROHIBITED. PARTICIPATION IN THIS RAFFLE IS SUBJECT TO THE RAFFLE DETAILS AND TERMS AND CONDITIONS OF THESE OFFICIAL RULES. IN THE EVENT THE RAFFLE IS ENTERED VIA A MOBILE DEVICE, MESSAGE AND DATA CHARGES MAY APPLY.